How Do I Get the Deed in My Name After My Mother Has Died? Deeds to land and vehicles do not automatically transfer after the death of a parent. If the mother included the property as part of a living trust, title will pass on through an informal process. More commonly, however, the property will be included as part of the person's estate. During probate, the estate's assets will be divided according to a will and state laws. Although an offspring is not guaranteed to receive title to the property, he may take steps to improve the likelihood of receiving the deed. Determine whether the property is included in a will or living trust. If there is a living trust, the trustee assigned to manage the trust will oversee the transfer of title to the individual designated in the trust. If the property is included in a will, it will be probated along with the rest of the deceased's assets. If neither a will nor a living trust is found, title will transfer according to state intestacy laws. Make a claim for title to the deed. 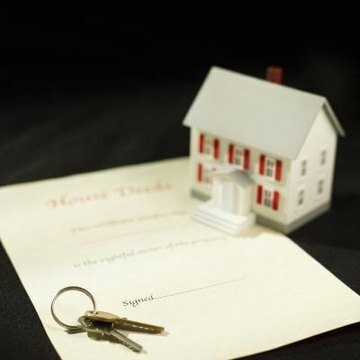 If the documentation clearly identifies you as the deed's heir, providing proof of your relationship through a birth certificate or similar mechanism will generally be sufficient to establish your right to the property. While right to the property is all that is necessary in living trusts, there may be additional complications during the probate process. For example, the court may require that the property be sold to pay for creditors' claims. Contest distribution to another party. In the event that the deed has been bequeathed to another party, a qualified beneficiary may be entitled to contest the distribution. While contesting a living trust is difficult and rarely successful, children of deceased parents have more options during the probate process. For example, the child can attempt to prove co-ownership or establish a right to inherit as a co-tenant. The child may appeal to have a will voided for fraud and inherit through intestacy laws. In any case, it is best to consult a qualified attorney to discuss options for pursuing a claim. Spencer, Jack. "How Do I Get the Deed in My Name After My Mother Has Died?" , https://legalbeagle.com/8700563-do-name-after-mother-died.html. Accessed 24 April 2019.